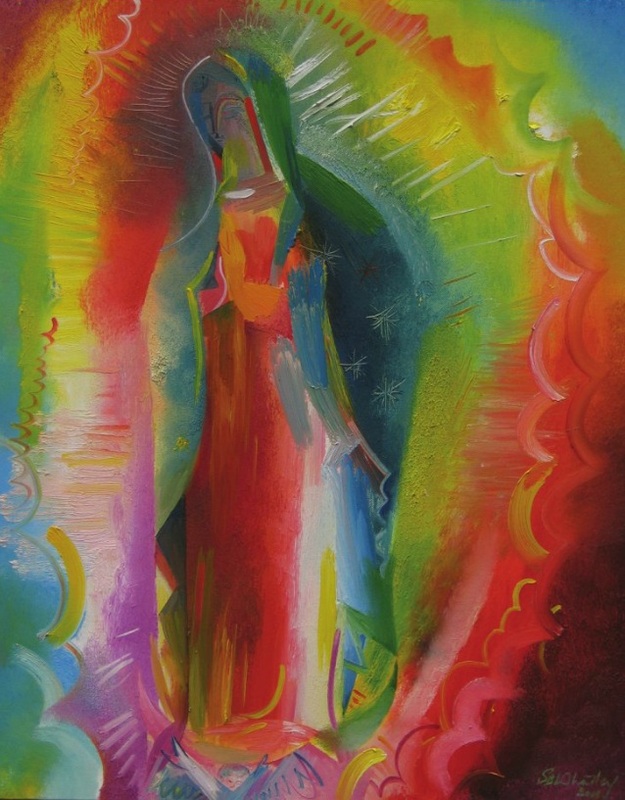 Happy Feast of Our Lady of Guadalupe! Today we celebrated by waking up really early (I mean early…really) and heading off to the church for a huge celebration. It was good, but needless to say it has left me tired. I loved seeing the devotion to Mary under this title. It is one that I have never really heard of much until the past few years. There was a modern-day picture of our Lady of Guadalupe in my archdiocesian newspaper, so I played around with it and here it is. I find it really beautiful. For our creed class, we were each given a part of Jesus’ life to teach/present to the class. It was based off paragraphs from the Catechism of the Catholic Church. As you can see from teh title of this post, I had the infancy and childhood of Jesus. My Catechism numbers were 522-534. I started out with a song to reflect on in which we talked about after reading through my reflections. It is all over the scriptures that I read; there is to be a Messiah! I wish I could tell you all exactly how he will come, but I don’t know. If he is going to rule over all, he must be coming as a great king. There are a lot of symbols and rituals we have. One day I hope that they will lead to something greater. This king is said to be able to deliver us. With the oppression we face, some saving is what we could need. The people were waiting for Messiah for years. Everywhere around them were the symbols and signs of what was to come, but when it hit them they would not see. Do we stay open to the signs that are around us, hints and nudges from God that lead us to something greater? God chose me from many to prepare the way for His son. I could feel myself on fire and desiring to get people to be ready to follow Him. Yes, I had many followers. Once this chosen son of God comes my way, I would know. My works involved preaching to the people, and giving a Baptism of conversion. Later we find out that John also died the martyr’s death for Jesus, on top of what he shared with us. It is truly amazing what one would go through for Christ. Knowing that Jesus is coming again, what are you doing to prepare His way? The look on my daughters face told it all. There was peace. Of course she is scared, I am too. Who knew but the Lord if Joseph will take her still? My daughter is going to give birth to our Messiah. It is hard to believe that this could be true. Even so, I must now make sure she is protected and cared for if this child is to grow up to be who this angel told her he would be. The yes that Mary gave was such a turning point in our history. Now we look to Mary as our mother. Do we allow her to be our mother in the same way that she was mother to Jesus? We knew something was going on. There was a star in the sky unlike any other. My fellow companions and I were struck with curiosity, so we drew near to the place that the star was over. There, lying in a manger was a child with his parents surrounding him. This must be the one that we have heard of from the prophets who traveled around. Who would have even figured, a king to be born to such a poor and humble family, with us mere shepherds as the first witnesses? The king came as a child, to save all of us. Who today is born in a stable and laid in a manger? It is only imaginable what Mary and Joseph were thinking when the shepherds came to witness the birth of the King. We often wonder, “how must we enter the Kingdom of God?” Just like that of Jesus, as a child. Only When Christ is formed in us, will the mystery of His birth be fulfilled in us. How can we emulate this simple birth of Jesus today? Two parents brought their child to me. I knew there had to be something special about him, but I was not sure at that time. As was customary, I did the circumcision. It is a sign of submission to our Law and the worship of Israel. The boy grew up participating in the Law his entire life. What does circumcision mean to us today in a society where it does not happen much? That moment in Jesus’ life is a sign that prepares us for the “circumcision of Christ,” which is Baptism. How is this so? Oh what a glorious even this is for us! We traveled very far as soon as we heard of a Messiah of Israel’s birth. We all wanted to adore the child Jesus in person and bring him gifts. Sure we were Pagans, but by going to see this newborn Son of God and Savior of the World, we could open wide the doors for our people! To bend down at His feet and leave Him fine gifts was such an honor. We had been asked to return to tell others of this great news, but then we decided to go somewhere else to save the child’s life. It was in this visit of the Magi to see Jesus that all became worthy to share in the heritage of Israel. What do you think it was like for these Magi to travel such a long distance to see the birth of this Messiah and to do Him homage? Would we travel that far to see a child said to be the Son of God or would we consider a hoax? As the child Jesus was being brought into the temple, as is customary, I took him into my arms and praised God! The Holy Spirit had revealed to me that I would not die until I had seen the Messiah. I knew it from the moment I saw the child in his mother’s arms. How beautiful it was to see Jesus so peaceful there. Yet I knew of the sword that would pierce him for all of us. The presentation showed Jesus as the firstborn son who belonged to God. While here Jesus is seen as the Messiah that has been long-awaited for, but also is a sign that will be spoken against all of His life. Not only that, but this sign is still spoken against in today’s society. What can we do to take away that with speaks against this marvelous sign and wonder that is our faith? When I heard that I must flee to save Jesus’ life, I woke Mary up and we left immediately. It was said that Herod was sending His armies to kill all the firstborns in order that no king should arise from them. This struck such a fear in me that I acted immediately. They were after my son! We spent some years in Egypt waiting for the Lord to tell us what to do next. While we waited, I took in every moment I could have with Jesus. I did not know when things would change. Here I am, on my death bed, and I trust that I will see the great things Jesus will do as I gaze from Heaven. Coming home from Egypt was something we had wanted for the longest time. Mary’s mother was so glad to see us. Jesus was happy to see this home that we spoke of over and over. That time of fleeing was hard, but I got time with my son. This fleeing to Egypt again shows the opposition of darkness to light. Many innocent children lost there lives to the darkness trying to find Jesus. When the family came back from Egypt, we are called back to the exodus of Moses from Egypt. The connection here shows Jesus as the one and only liberator of God’s people. Are we ready to make an exodus for the sake of God? What things do we need to leave behind for our faith? If you had told me when Jesus was younger that he was the Messiah we had all been waiting for, I am not sure I would have believed you. I saw Jesus grow up under the care of Mary and Joseph. They were the most loving parents that I had ever seen. Our Messiah lived a life just like any other human being in our situation would have lived. He played with my son, helped Joseph with the carpentry work, and listened to his parents. They were a great little family, there was nothing usual about them and I saw at that time no particular greatness that made him different than anyone else. As he got older, he did have a keen interest in scriptures. Of course, looking back now I can see the signs that brought him to this point where he is carrying out his Father’s work. I am so blessed to have known him as a child. Jesus lived an ordinary life as a child. It is in this way that we can really relate to him. There was nothing extravagant show outwardly about him. This basic life that he lived allows us to be in fellowship with him. It gives hope as well, to those who think they have to be great all of life to achieve something. Anything can be created with hope and love that is placed in the Lord. How do we relate to the simple life of Jesus’ childhood? Oh how the Lord has blessed me! Jesus was a faithful young boy who followed all of the Jewish Laws with great obedience. Never once do I remember him being disobedient to Joseph or me. He heeded every word that we said. There was just once that I remember particularly where he gave us a bit of a fright. We were traveling in a caravan between cities for a couple of days. I had thought that Jesus was playing with our friend’s son when Joseph and I realized that he was missing. How could I have lost God’s son! I was so distraught. We went back to look for him. After much searching, we found Jesus in the temple with the elders of the temple. What a relief it was to have had found him! I could see that the Lord was beginning to give him a glimpse of this mission that he was given. It would not be long, I could tell, before he would really start his work. I wondered what it would be like. Now I know; it has been a long road and people persecute him. “Lord, protect my son.” This is my prayer. Obedience, it is something that a lot of people struggle with. Jesus, our savior, was able to show such humble obedience to his parents and the religious laws to which he lived under. This obedience that Jesus shows to the Jewish Laws and his parents restores what the disobedience of Adam had destroyed at the beginning of time for the human race. It is also interesting that the only event to enter the Gospels of Jesus’ childhood is when he is found in the temple. He was there talking with the elders. In this, we see a glimpse of the mystery of his mission that stems from his divine sonship. How do we emulate the same obedience Jesus had? Is our faith just as simple as his or do we over complicate things? This is a video I was shown that someone posted on Facebook. It is awesome enough that I had to share with all of you!